An astounding 34,000 mini Martin Luther action figures were sold out within the first 72 hours of availability. 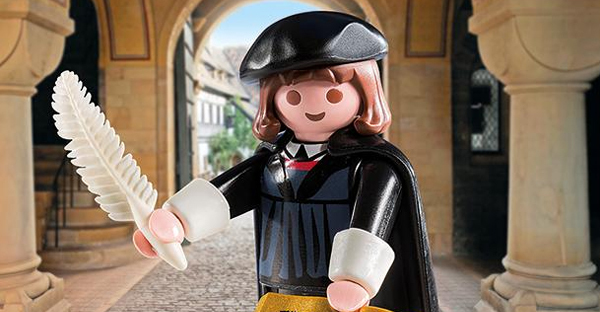 The smiling Reformer toy made by Playmobil was created as a kitchy keepsake for German tourist boards and Bavarian Lutherans to mark the upcoming 500th anniversary of the Protestant Reformation in 2017. “I’m used to Luther the first modern man, Luther the rebel against overbearing church authority, Luther the anti-Semite, Luther the destroyer of the unity of Western Christendom — but Luther the action figure is a new one,” the Rev. Dr. Sarah Hinlicky Wilson of the Institute for Ecumenical Research in Strasbourg, France, told Thunderstruck. Of course, United Methodists have a warm hearted connection to the leader of the Reformation since John Wesley’s own new birth experience occurred at Aldersgate in 1738 while listening to a reading of Martin Luther’s preface of the Epistle to the Romans. Steve Beard is the founder/creator of Thunderstruck.